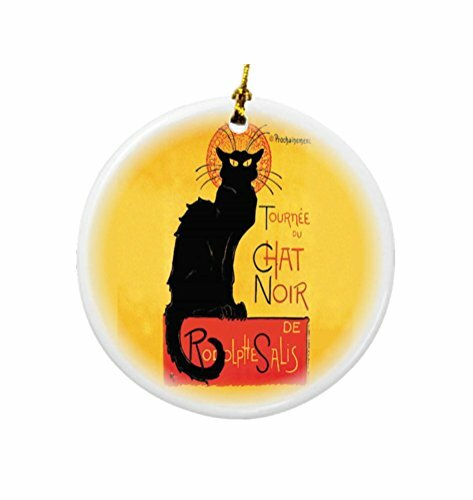 The Le Chat Noir Design Ornament is beautiful for decorating your tree or as a window decoration. This porcelain ornament can also be a great gift for your family and friends, to commemorate each holiday or special occasion. This ornament measures 3" round. The ornament comes with a string of gold thread to make a fantastic and memorable keepsake. As these ornament are manufactured by Rikki Knight here in the USA you can be assured that this ornament will be a unique piece to your collection. Disclaimer: All images are printed onto the ornament - The Texture of this ornament is a flat porcelain surface. Any images that appears to be 3d, textured, or glittery are flat printed images.